Based on popular demand, Alchemilla will now be offering our bar stools to walk-ins only. Simple Mediterranean food for sharing. Dishes are served from an open kitchen as they are ready, leading to a relaxed informal dining style experience. There is a real emphasis on fresh seasonal produce with our menu constantly in motion to reflect just that. The forward thinking wine list focuses on natural and organic wines that are complimentary to our food offerings, whilst the cocktail list has some fresh and striking combinations. Expect knowledgeable and helpful staff that can help you with all aspects of your meal. Our restaurant is split in to 3 levels- the Mezzanine, Ground Floor & Basement Dining Room so do look at all options when booking. For tables of 5 + please call the restaurant directly, and we ask for a £5 per head deposit to secure these larger tables. We are a small restaurant so please do not turn up too early or late for your table, and we request that you stick to your allocated time to allow us to offer all customers the best experience. If you do not turn up for your table it will be given away after 15 minutes unless organised directly over the phone with the restaurant. Delicious food. Lovely place. Hope to be back. Interesting dishes, well presented and tasty. Would happily return. Fast, clean, tasty food, friendly atmosphere and a good vibe overall. Service was great and prices were on point. Definitely recommend this for small groups or couples. It was uncomfortably cold at our table. The food was nice enough, but not good value for money. The portions were small for the price, and the plates came in a strange order. They do say they'll come when they are ready, but bringing the cold salad dishes after the main style meat dishes made no sense, and made for a pretty disjointed dining experience. Very tasty food, fantastic service - thank you! Amazing evening, superb food and staff. The food was very a mixed quality. There was very little for one of us who is vegetarian and lactose intolerant. Been a few times previously but felt it lacked variety and quality this time round. Hi there. 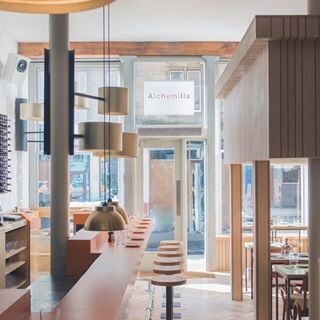 Alchemilla is my favourite restaurant. But on visiting last night I was disappointed. Service wasn’t great, and we were sat right infront of the draughty door every time it opened. My two favours dishes are the burrata variation and the roasted cauliflower but was gutted to see that they, along with the amazing focaccia had been removed from the menu. I really hope it’s more like it was when I next return. Many thanks. What a pity. No atmosphere, tepid food in unappetising neon colours and unhappy staff. Food was delicious and menu had a good mix of options. Vegetable dishes inventive and delicious. Attentive, friendly serving staff and chefs who chatted to us about the food and wine, made us feel very welcome and looked after. So nice to have food of that quality in a relaxed atmosphere, served so simply. Food was really next level, bread is so so good and squid with grapes and the cauliflower with pistachios were highlights for me! Awesome food, great service, very welcoming! Had a seat near the door which was a chilly. 1.5hrs time limit on the table, food was served quickly, it was fresh and flavoursome but not a lot of it for the price charged. Best food in Glasgow. Such imaginative combinations and flavours. Friendly staff too. Top notch every time. Always an absolute pleasure for the senses. Thank you for another great evening. Some of the food was absolutely terrific (Olives, cabbage, sea bass carpaccio, octopus, gunard ), but some was pedestrian (  lamb, chicken, pork ) and, usually my favourite veg - cauliflower - was very dull indeed. The highlights were exciting enough to compensate for the rest and hence the overall high ratings. The staff were excellent. Sensational food every dish an explosion of flavours. Would return every night if I could. Please share your  recipes! Delicious, creative small plates at a reasonable price in a nice setting.